[toc]A headache is one of the most common ailments that people suffer from. Headaches can be of many types, from migraines, tension headaches to sinus headaches. It can range from dull throbbing pain to intense pounding pain. Sometimes the pain can be centralized on one side of the forehead or it can radiate towards the back of the head. Whatever may be the cause of a headache; there are quite a few home remedies that can ease the pain. Here we present to you a few natural remedies for headaches. Ginger has anti-inflammatory properties that helps to reduce inflammation. Ginger root has been used for centuries to treat aches and pains. It also contains a compound called cineole which is found to relieve anxiety and stress. 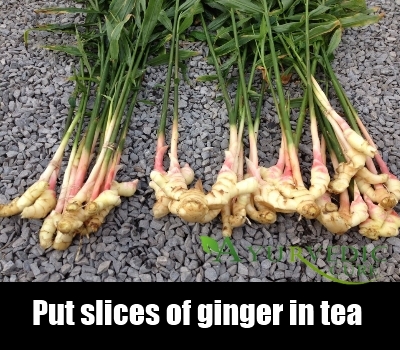 Peel an inch of fresh ginger root and slice it thinly. Steep the sliced ginger in a cup of boiling water for 15-20 minutes. Strain the ginger pieces and add a teaspoon of pure honey to it. Sip this homemade ginger tea and you will find instant relief from headache. When you have a tension headache arising out of emotional stress and worry, then a cold compress is just what you need to ease the pain. Soak a clean cotton towel in a vessel filled with cold water. 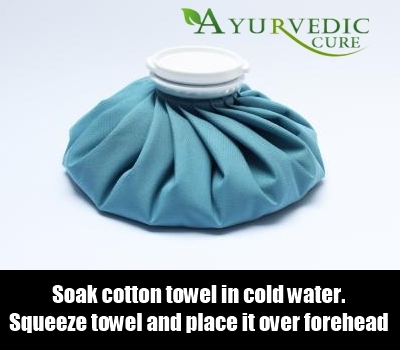 Squeeze excess water from the towel and place it over your forehead and eyes. Once the towel comes to a normal temperature, soak it in cold water again and repeat the process. The cold will help to constrict he blood vessels and help ease the pain. 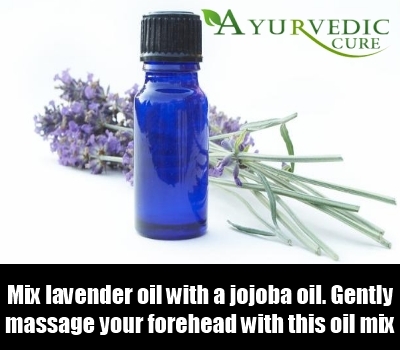 Mix a few drops of lavender essential oil with a tablespoon of jojoba oil. Gently massage your temples and forehead with this oil mix. Make sure that you massage your forehead with a firm but gentle pressure. Lavender oil is believed to have soothing properties that eases pains and aches. If your headache is induced due to stress, then there is nothing better than having a cup of chamomile tea. Steep a bag of chamomile tea in hot water. Add a teaspoon of honey and sip the hot tea slowly. 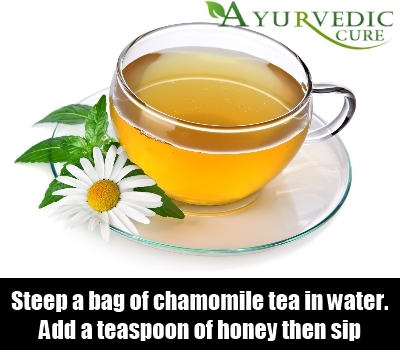 Chamomile has anti-inflammatory properties that reduces inflammation. 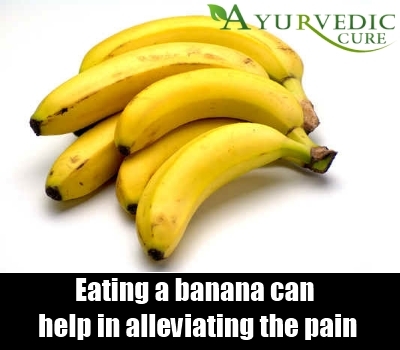 Eating a banana can help in alleviating the pain. Banana is rich in magnesium that helps to calm nerves. It has been found that many people who suffer from frequent headaches have a deficiency of magnesium in their body. So increase the intake of food that contains magnesium. 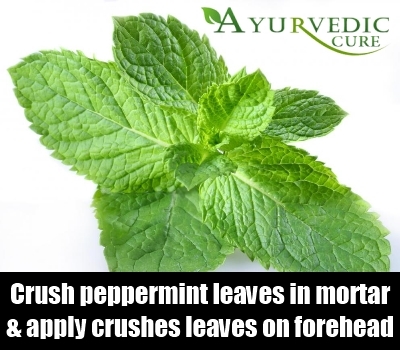 Crush a handful of peppermint leaves in a mortar and pestle and apply the crushes leaves on your forehead. Wash off after 10-25 minutes. Peppermint has soothing and calming properties that help to alleviate pain. If fresh peppermint is not available, you can rub a few drops of peppermint oil on your forehead and temples to get relief from headache. One of the best ways to get relief from headache is to drink plenty of water. Most of the time our body is dehydrated and this in turn causes aches and pains. If you do not like to have plain water, then you increase your fluid intake by drinking lemon juice and herbal teas. These were a few natural cures for alleviating a headache. 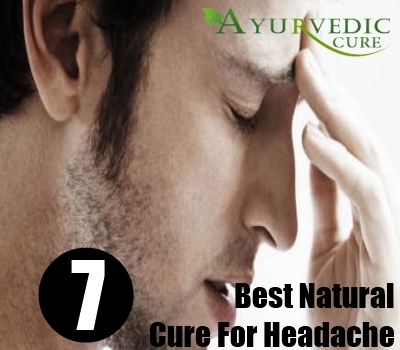 If you suffer from persistent headaches that refuses to go even with these home remedies, then it is best to see a doctor.